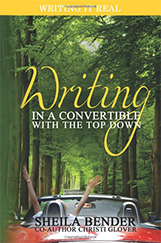 This is from Writing in a Convertible with the Top Down by Sheila Bender and Christi Glover. It is a book of letters we wrote to one another about our writing lives. I hope readers will enjoy this letter, which has always been one of my favorites. To this day, Clarabell is a character I remember, the one who didn’t speak, the one who swept out an old, silent attic and waited for imaginary friends to fill the space. How odd to end today with television. I’ve been to the desert—the air like air in a sauna, the orange brown dirt roads, men with arms the color of clay, roadrunners in our path, magpies whirling skyward here and there from yucca plants, the mockingbirds and gold finches, jack rabbits whose ears were so tall I thought at first there were deer in the sagebrush. It’s quiet where I was and clean. I loved the sun, so bright it gives the air a yellow aura, and the lovely flatness before Red Mountain, Black Mountain, the buttes and the Florida (Flor-ee-da) ranges, tinted purple and jagged in the distance. I was 97 miles from El Paso in New Mexico near a town formed when the Topeka Railroad met the Santa Fe. The companies chose to call the town by the name of a long time employee named Mr. Deming. My father bought a half-acre of Deming desert in the ’60’s. Once I told him I liked New Mexico and he gave me his half-acre with many reminders that it was worthless. But I like land that’s worthless. That way it’s land. It’s what it is and not what someone thinks it should be. Thinking this way, I want to tell anyone who wishes to write to find a piece of “worthless” land—some corner off a sidewalk along a long forgotten lot, the neglected strip between two buildings, a gully in a park, whatever they can find that seems ignored. They must stand as close as they can to it, see the view from there, listen to the sounds they hear in that place, smell all that’s in the air. They will learn to drink in through the senses. But there is more: A state park ranger outside Deming told me about the way kids will catch a baby mocking bird, cage it for a time and keep it fed. When let free, the bird will stay around the child’s house, flying and whistling, homesteading where it was taken. That’s how I feel about this land. I was taken to it by surprise, and it fed me, land silent as Clarabell’s attic. In my memory, I homestead there, honoring the part of me my senses set free. 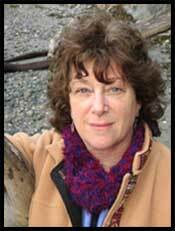 Sheila Bender is a poet, essayist and book author, who facilitates many writers through her teaching and instructional articles. She has written for The Writer, Writer’s Digest and many online venues. She very much enjoys her work teaching online for members of Story Circle Network. You can learn more about Sheila, her articles and her books on her website http://WritingItReal.com.